In the course of our energy tax practice, we began to realize that a substantial number of the projects we work on relate to energy efficiency aspects of facilities at large airport facilities or at airport dependent support facilities, such as: parking garages , hotels , warehouses , truck distributors , and port facilities. Multiple U.S. and international airports are evolving into huge building complexes. For example, the Orange County airport in California has more office building square footage than Los Angeles and on February 18th, 2011, Indianapolis announced a 30 year plan to develop a mini-city airport comple. The term “Aerotropolis” was coined by Dr. John D. Kasarda, Director of the Kenan Institute at the University of North Carolina at Chapel Hill. Dr. Kasarda describes the development as follows: "airports will shape business location and urban development in the 21st century as much as highways did in the 20th century, railroads in the 19th and seaports in the 18th." In the February 26th issue of the Wall Street Journal, Greg Lindsay writes that "an Aerotropolis can be narrowly defined as a city planned around its airport or more broadly as a city less connected to its land-bound neighbors than its peers thousands of miles away.” The ideal Aerotropolis is an amalgam of made-to-order office parks, convention hotels, cargo complexes, and even factories which in some cases line runways. Many jurisdictions believe that the creation of a thriving Aerotropolis is the key to modern era economic development. One way to jump start the construction/assemblage of the Aerotropolis is to integrate existing airports. For example, the planned Indiana Aerotropolis would integrate 5 existing airports. Today's terminals are much larger than previous airports with a much more elaborate in terminal consumer support system. Amenities include higher-end restaurants and lounges, leading clothing stores, airline club facilities, and a much broader range of retail offerings. Older airports were surrounded by numerous smaller profile motels and hotels, separate car rental facilities for each rental car brand, and numerous private vendor parking garages. The newer Aerotropolis facilities have huge airport hotels, very large airport owned multi-deck near terminal parking facilities, and centralized car rental centers. This type of centralization makes everything more convenient for the customers. Trade shows and business meetings can be held right at larger airport hotels and hotel convention centers. Parking takes less time and the central rental facilities reduce the number of airport buses traversing the airport while also eliminating waiting time. These newer and larger facilities are better suited for leveraging EPAct tax opportunities which are based on square footage. Pursuant to Energy Policy Act (EPAct) Section 179D, warehouses making qualifying energy-reducing investments in their new or existing locations can obtain immediate tax deductions of up to $1.80 per square foot. If the building project doesn't qualify for the maximum EPAct $1.80 per square foot immediate tax deduction, there are tax deductions of up to $0.60 per square foot for each of the three major building subsystems: lighting, HVAC (heating, ventilating, and air conditioning), and the building envelope. The building envelope is every item on the building’s exterior perimeter that touches the outside world including roof, walls, insulation, doors, windows and foundation. There are multiple 30% or 10% tax credits available for a variety of alternative energy measures with varying credit termination dates. For example, the 30% solar tax credit expires January 1st 2017 and the 10% Combined Power tax credit also expires January 1st 2017. The 30% closed loop and open loop biomass credit expires January 1st, 2014. All alternative measures that are eligible for the 30% and 10% tax credits are also eligible for equivalent cash grants for the three years staring January 1st 2009 and ending December 31st 2011. Airports are taking the lead with Light Emitting Diode (LED) building lighting applications. Throughout the country, many parking garages are quickly moving to LED lighting. The biggest category of airport LED parking garage tax projects we have worked on are large airport parking facilities. Also, many leading brand coffee sellers, restaurants, hotels, and retailers typically found at airports are quickly moving to low wattage LED lighting. This means that airport facility personnel and energy managers will have the first move advantage of evaluating a wide range of LED lighting applications. As low wattage LED lighting expands into more and more facilities, airport energy managers will be able to cap the permissible wattage levels at all airport leased space to a much lower level. By capping lighting wattage levels in their leases at a maximum wattage standard based on either airport policy, maximum EPAct tax deduction wattage level, or local building energy code, airport energy mangers will be able to greatly reduce their heating, ventilation, and air conditioning (HVAC) costs related to offsetting higher heat generating higher wattage's. The largest Aerotropolis buildings that host people include the main terminal facilities, shops, food courts, baggage areas and airport hotels are conditioned (meaning they are air conditioned spaces.) Whenever a building space is air conditioned, HVAC is by far the largest building energy use category. Accordingly, it is critical for large and growing Aerotropolis facilities to invest in very energy efficient HVAC systems such as central chiller plants, magnetic bearing chillers, thermal storage, geothermal, and energy recovery ventilation. Most often these very energy efficient HVAC measures will qualify for Section 179D EPAct tax deductions. These facilities are also excellent candidates for HVAC related alternative energy generation measures such as combined heat and power, micro turbines, geothermal and fuel cells, all of which are eligible for tax credits and very favorable tax depreciation. 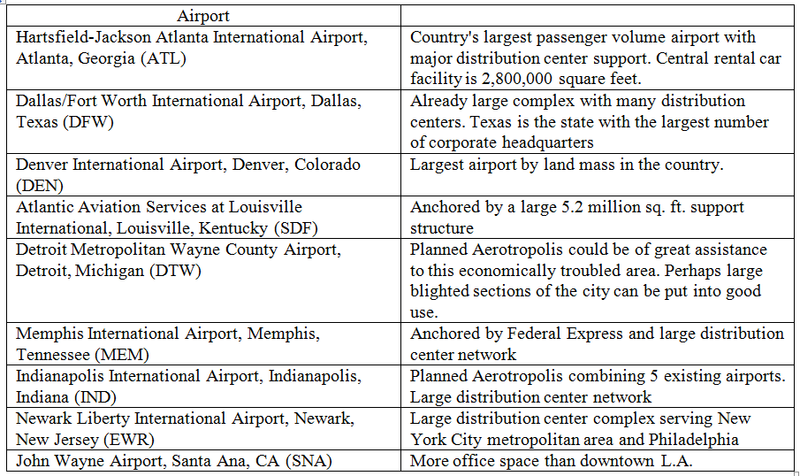 Aerotropolis complexes are in large commercial markets such as: California, Newark, New Jersey, Atlanta, Georgia, Dallas Fort Worth, Texas, Louisville, Kentucky, Memphis, Tennessee, and Indianapolis, Indiana are surrounded by huge numbers of very large warehouses and distribution centers. Since the Section 179 EPAct tax incentives are based on square footage these facilities can avail themselves of substantial tax incentives to support energy efficiency building investments. For example, a 500,000 square foot warehouse that installs energy efficient lighting and an energy efficient heater at the EPAct standards can obtain up to a $1.80 per square foot tax deduction of $900,000. The UPS Worldport facility contains 5.2 million in square feet, making it eligible for $9,360,000 in distribution center tax benefits. These facilities typically have large flat roofs and are ideal candidates for rooftop solar photovoltaic (P.V.) installations and 30% tax credits once the energy efficiency upgrades are accomplished. The energy efficient lighting and heater upgrades are typically accomplished for far less than $1.80 per square foot leaving excess deduction to be utilized for the roof upgrades required to prepare for solar and maintain roof warranties. The larger the Aerotropolis supporting passenger traffic the more hotels are required. As Gina La Barre, Vice President of Crowne Plaza Hotels and Resorts has noted, "We're seeing a rise in airport hotel developments, with nearly 20 airport properties in the current Crowne Plaza Americas portfolio and another three in the pipeline." Hotels are, by statute, the most favored EPAct tax deduction category. If lighting is installed at the most common ASHRAE 2004 building energy code or better, the hotel will qualify for the full lighting EPAct tax deduction. It is important for a hotel to install both energy efficient building lighting and energy efficient lighting in the guestroom interior package to qualify for tax deduction. The ASHRAE HVAC comparison for achieving Hotel EPAct tax deduction are individual room units. This means that any hotel that installs a central HVAC system will generally qualify for the HVAC EPAct tax deduction. A 200,000 sq ft hotel with energy-efficient lighting and central HVAC can qualify for a potential $360,000 EPAct tax incentive. 1) Hire a strong Aerotropolis energy manager that can also communicate to the off-Airport facilities support structure. 2) Where possible, utilize large central facilities for parking, car rental centers and hotels. 3) Set overall energy efficiency design standards for airport owned and leased spaces. 4) Lighting - Set watts per square foot standards at the lower of Aerotropolis policy, EPAct or legal building code. 5) HVAC- Place a major emphasis on highly energy efficient central systems. 6) Alternative Energy - makes ample use of alternative energy systems for HVAC such as geothermal and combined heat and power. 7) Utilize scalable central systems to accommodate projected growth. The Aerotropolis is a huge integrated building complex that will increasingly depend on. An energy efficient Aerotropolis will lower operating costs and passenger fees and consume a lot less finite energy resources. We can all look back at the previous development of our seaports and rail systems and comment "if only they had done it better". History will repeat itself unless we recognize that we are in the Aerotropolis era and the time to optimize design is now. Substantial tax incentives are available to help support the energy efficient Aerotropolis.